This is a republication for a wider constituency of Group Meetings that Work (St Pauls, 1994). This book is designed to help groups, teams and committees of all sorts to realise increasingly more of their potential for promoting all round development and enjoyment in and through their meetings. This is a ‘how to’ book, a manual and helpmate. Based on over thirty years experience, it is written for anyone who wants to help others to think and discuss together and to tackle tasks collaboratively in and through meetings. The book aims to help those chairing or attending meetings or groups to get members thinking together, taking everyone’s contribution seriously and enabling them to have a say in decisions which affect them. 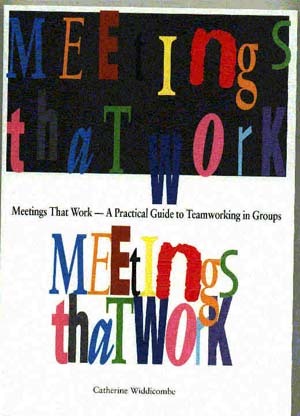 Treating each and every meeting as unique, the book deals with all aspects: forming a group or a committee; preparation for sessions; the dynamics of meetings; getting people to pool ideas, insights and expertise; dealing with problems; concluding meetings; actions required after a meeting. Throughout, attention is paid to practical and theoretical details which make meetings work or prevent them from doing so. This cuts through the rubrics to the hard realities of social and spiritual interaction in meetings. The book is arranged so that the reader can focus on what is specifically needed for a particular meeting. It is a book to be used selectively or as a reference book, rather than to be read from start to finish. ".... an excellent and comprehensive guide which will be useful in many situations. Catherine Widdicombe has managed... to write lucidly and in some depth about a subject which is often dealt with superficially. This book should be on the shelf of everyone who might have to facilitate a meeting or work with a group."